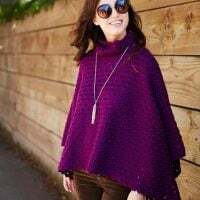 For the fall season, why not make one of these 10 great crochet poncho patterns? My daughter is already starting to feel the chill in the air so I think it is time for me to make her a poncho to take with her to school. Ponchos are a comforting and perfect fall accessory. Like a little blanket you can wrap around yourself that stays put! This collection includes ponchos you can make for adults and kids, so grab your cups of coffee (or tea!) and save copies of these patterns for your fall crochet collections! 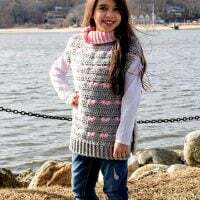 Find 3 more free Poncho Patterns for Girls here. If you would like to try a fall poncho crochet pattern which uses different crochet stitches why not try my Fall Poncho Pattern. It is available in multiple sizes (from baby to plus sizes) and has tutorials for each stitch used! Save these free poncho patterns for later. 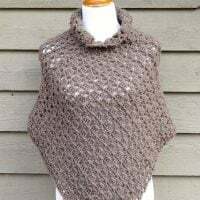 This beautiful poncho design is crocheted with 4 balls of medium weight  yarn (Jennifer worked with Lion Brand's Vanna's Choice Yarn in Taupe) and a 6.5 mm [K] crochet hook. This simple design can be customized to basically any size as it is crocheted as a rectangle and then seamed to form the poncho. It is cute and trendy and a great project for all levels of crocheters. Print or save your own copy of the pattern and crochet along with Jennifer's video tutorial (below). The Crochet Ava Fringed Poncho from Ashleigh is super pretty and has a fun and flirty fringed edge. This fringed poncho is crocheted by seaming 2 rectangles together. Follow along as Ashleigh demonstrates how to make this pretty wearable. Grab your 6 mm (J) crochet hook and light weight  yarn. Ashleigh uses LB Collection® Cotton Bamboo Yarn. 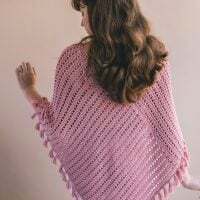 Get her free pattern linked below and follow along as she demonstrates how she makes this pretty poncho. Crochet his stylish cowl necked poncho with medium weight yarn  and 5 mm (H) crochet hook. The project uses Caron Simply Soft Yarn. The design is available in sizes ranging from XS/S-L 28-42" to XL-4XL/5XL 44-62". Follow along with the Crochet Crowd to make this perfect fall wearable. Mikey takes you through the project, step-by-step. This stunning poncho designed by Kristin Omdahl for Red Heart Yarns, is crocheted with Chic Sheep by Marly Bird™ Yarn. The free pattern is available as a PDF download from Red Heart Yarns. Watch Marly Bird's video to see how to make the Perfectly Panache Chic Poncho. 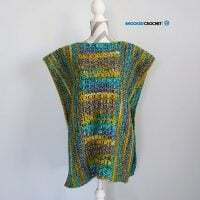 Make this lovely poncho with a 6 mm (J) crochet hook and medium weight  yarn. 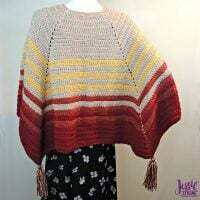 This is a one-size fits most poncho and it the finished project measures 30 inches from the neckline to the center peak and 36 inches across from elbow to elbow. This adorable and perfect for school poncho is available in children's sizes 2; 4/6; 8/10; 12/14. Crochet this with bulky weight  and a 6.5 mm (K) size crochet hook. The poncho has a split collar and side vent style opening from the waist to the seam. Practical and adorable and perfect for active children who love to run and play! Cute as a button this little poncho is sized for toddlers (2T-3T). 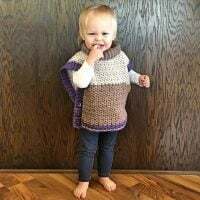 Crocheted with Caron Cake yarn (medium weight ) and a 6 mm (J) hook this toddler poncho uses just one skein of yarn! This fun poncho is available in six different sizes ranging from XS (S, M, L, XL, XXL). The poncho is crocheted with medium weight  yarn and a 6.0 mm (J). This pattern was initially released as a crochet along and there are 2 parts to the video tutorial and pattern. They are all linked below. The Harvest Poncho is crocheted in Light / DK Weight  Yarn with a 4 mm (G) hook. Sized to fit an adult woman, it has fun tassels on the corners and measures approximately 22 inches in length (top to bottom). This traditional Granny Square Poncho is adorable to wear and easy to crochet. The demonstration video from Jonna Martinez uses 2 Caron Cakes and a 6 mm (J) size crochet hook. She crocheted her poncho for 25 rows. Grab the pattern from DROPS and crochet along with Jonna's video below. 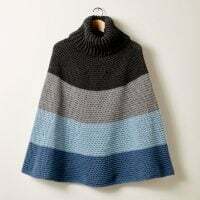 This poncho is available in many sizes.